Music is an important aspect of a reception. 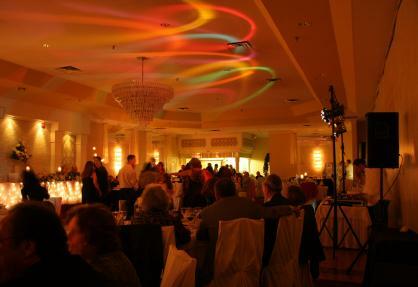 The music for your wedding reception sets the mood for the entire event. This makes selecting the right reception music a high priority since it helps to move the evening along while inspiring wonderful memories. As you enter the reception, you want to be sure that everyone knows the party has started. Find an upbeat tune to herald the bridal party's grand entrance into the wedding reception. In addition to these classic party songs, you may want to consider a party dance tune that is on the charts. Look for tunes like Party Rock Anthem by LMFAO or others by artists like Usher, The Black Eyed Peas or your favorite dance music artist. While your guests are dining you probably don't want to boisterous dance music. Consider instrumental jazz, soft rock or light classical music and save the up tempo songs for when the meal is over. Look for jazz, soft rock or classical music online. If you have a DJ, he or she usually has a set of songs ready for the cocktail and dinner hour. A band may not be able to play quietly enough for this time, so consider having an mp3 player set up with a selection of music. The dance is the big part of the wedding reception for many couples and their guests. Pick out some special songs to make the night go smoothly. When choosing the wedding reception music for your first dance, you'll want to select something that means something to you as a couple. Perhaps the first song you ever danced to or the music that was on the radio when you shared your first kiss. Your first dance song is going to live on forever in your memory, so it should be special. If there's no music that reminds you of a special time, find a song with lyrics that reflect your feelings about each other. 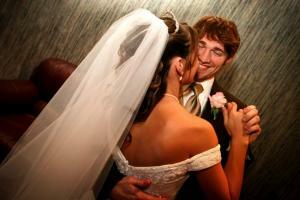 Plan the best wedding dance for your guests! Get everyone moving with fun tunes! Not every song needs to have a special sentiment attached to it. Many couples enjoy including fun songs throughout the wedding. Wedding line dances, like the Cha Cha Slide and Cupid Shuffle, are as popular as ever. Include the Y.M.C.A., the Bunny Hop and the Hokey Pokey in your music lineup, too. Guests of all ages may enjoy these fun and familiar tunes. In addition to the group songs, some couples like to pick out special fun songs for cutting the cake and doing the bouquet/garter toss. For a tongue-in-cheek cake cutting song, consider Hungry Eyes by Eric Carmen or Sugar, Sugar by The Archies; otherwise, go with a fun love song. It's Raining Men by The Weather Girls and Another One Bites the Dust by Queen are perfect for the garter toss, while Beyonce's Single Ladies is perfect for the bouquet toss. Wedding DJ: The wedding DJ is perhaps the most popular option for music, as he can play songs from a variety of years and genres. He will also serve as an emcee for the evening and bring along lights for creating stunning dance floor effects. However, not all DJs are excellent at keeping the evening moving along or at figuring out the right mix to get everyone up and moving. Wedding band: A wedding band is an impressive sight at a reception. Typically the lead singer can act as emcee. Bands offer that pizzazz that many DJs lack; however, they usually specialize in one style of music and may have a limited playlist. Also consider the cost of a band compared to a DJ, as DJs are typically more budget-friendly. Personal mix: A personal mix of music on an iPod or mp3 player is a good way to save money and have all the songs you want at your reception. However, you will need to find someone to be the "honorary" DJ, to make sure the songs are cued at the right time, and you will need to have a host announce things like cake cutting and special dances to your guests. The right mix of tunes will make your wedding reception stand out. Every time you hear a certain song, you will think back to that particular moment of your reception with fond memories.